145 people in our community are currently praying with you. This old gospel song, Hush by the Golden Gate Quartet, is a great example of early 20th Century gospel styling. O God, you made us in your own image and redeemed us through Jesus your Son: Look with compassion on the whole human race, O Lord; take away the arrogance and hatred which infect our hearts; break down the walls that separate us; unite us in bonds of love; and work through our struggle and confusion to accomplish your purposes on earth; that, in your good time, all nations and races may serve you in harmony around your heavenly throne; through Jesus Christ our Lord. Have courage for the great sorrows of life, and patience for the small ones. And when you have labored to accomplished your daily task, go to sleep in peace. God is awake. Now when the south wind blew gently, supposing that they had obtained their purpose, they weighed anchor and sailed along Crete, close to the shore. But soon a tempestuous wind, called the northeaster, struck down from the land. And when the ship was caught and could not face the wind, we gave way to it and were driven along. Running under the lee of a small island called Cauda, we managed with difficulty to secure the ship's boat. After hoisting it up, they used supports to undergird the ship. 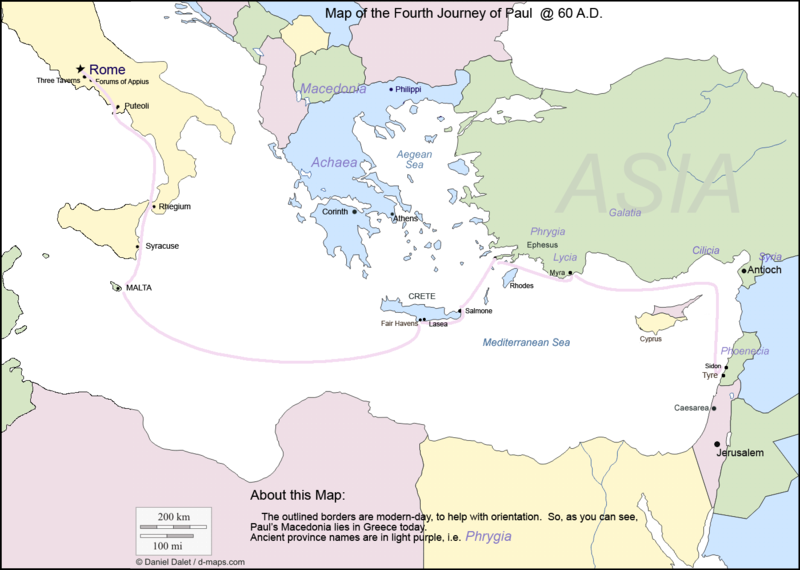 Then, fearing that they would run aground on the Syrtis, they lowered the gear, and thus they were driven along. Since we were violently storm-tossed, they began the next day to jettison the cargo. And on the third day they threw the ship's tackle overboard with their own hands. When neither sun nor stars appeared for many days, and no small tempest lay on us, all hope of our being saved was at last abandoned. 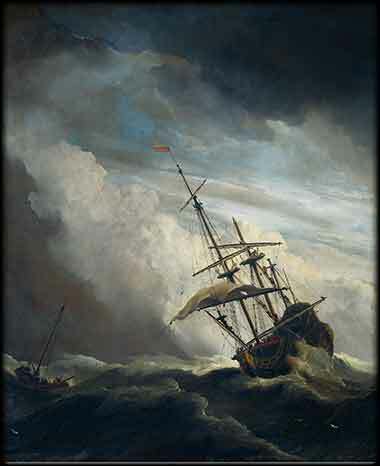 When a mild wind begins to blow from the south, the captain of Paul's ship gambles — and loses. Before they can make safe harbor at the eastern tip of Crete, a winter storm overpowers them and blows them southwest. They manage to haul in the ship's boat and deperately try to bolster the hull of the ship with wooden support, to keep the ship from simply being blown apart, but things get worse and worse. So they throw everything that's not nailed down overboard. But the storm just keeps coming. They finally abandon hope and await their doom.